In the 21st century, burial is not as easy as it once was. 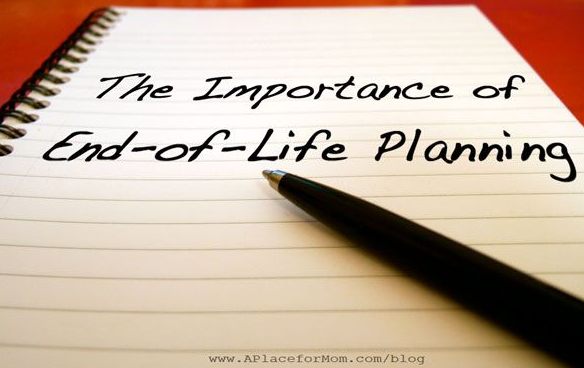 We now have end of life tours, end of life planning professionals, tailor-made funerals; In fact, there is an end of life revolution occurring throughout the U.S. as Baby Boomers bury parents, and grow older themselves. One topic that caught my attention recently concerned larger cemeteries offering feng shui burials to their Chinese immigrant families. 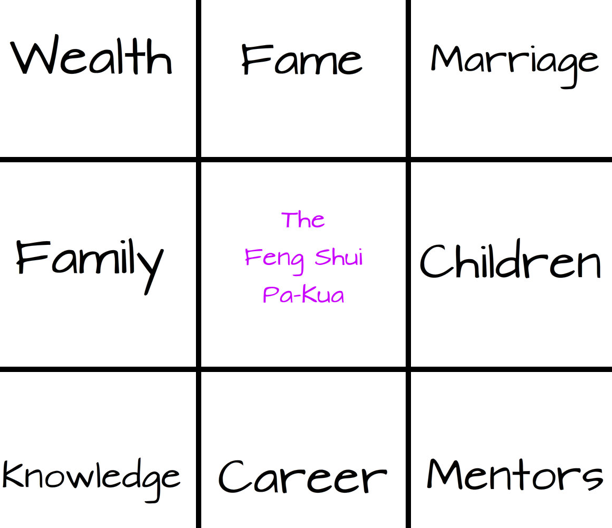 Feng shui (pronounced fung shway) became popular in the United States, Britain, Canada and Australia during the 1990s as people sought ways to live lives more in balance with nature. By using certain techniques and methods to affect the flow of positive chi (energy) in their living spaces, work places and burial sites, feng shui is said to promote balance, prosperity and harmony for those who reside there. Death and burial traditions are common in all societies. Feng shui has been used for thousands of years in burial traditions. 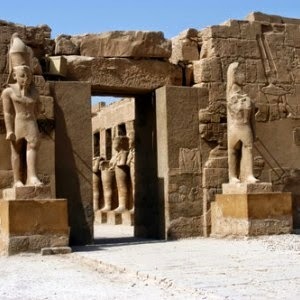 Ancient Egyptians understood the importance of man being in harmony with nature, both during life, and after. And archaeologists have discovered elaborate temples and tombs that adhered to these basic harmonious principles. 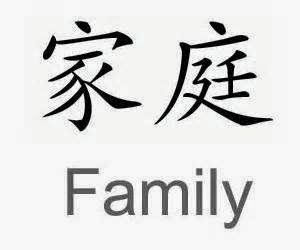 The Chinese believe that there is a connection between ancestors and their descendants, even after death; that they continue to share a comparable wavelength. In other words, if the burial of a relative is not considered auspicious and certain requirements are not adhered to, negative frequencies could be passed down to family members and future generations. 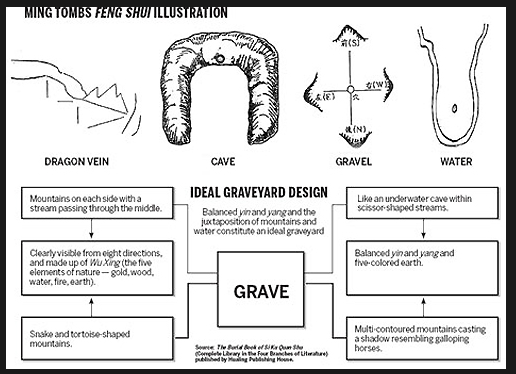 A feng shui burial is made up of many components. Since the body must remain intact, burial is the option most often taken. The first thing to consider is the location and direction of the grave. When practicing feng shui, certain directions are considered more auspicious than others. Also the direction the body is pointing and the location of the tombstone are believed to be important. And the day on which to hold the funeral must be calculated by a feng shui master. Here are just a few feng shui practices that apply to a grave’s physical arrangement. 1) Green grass is encouraged to grow on family members graves so relatives water, fertilize and weed around the plots and tombstones. 2) Feng Shui discourages burying a loved one near a tree because the roots can interfere with the coffin. Trees are not allowed to be planted on graves either. 3) Cemetery gates must not pass over any graves because this is considered bad luck and could lead to legal entanglements for the family. 4) It is also bad luck to step on a grave so walkways are constructed in Chinese burial grounds. 5) The dirt on top of a grave should never be allowed to become concave because water will pool there and could cause complications to the grave, and the health of the family. 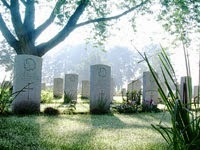 6) Grave sites should be arranged in arcs instead of in straight rows. 7) A Feng Shui master should calculate the correct angle at which to bury the body, and also the day on which the funeral should be held. 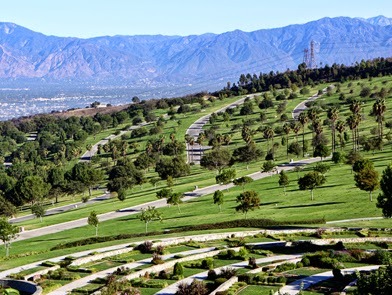 There are numerous cemeteries in the U.S. that are putting the rules of Feng Shui into practice by developing feng shui “neighborhoods.” Most of these are located in California and include Rose Hills Cemetery in Whitter, Fairhaven Cemetery in Santa Ana, Santa Rosa Memorial Park in Santa Rosa, and Forest Lawn Cemetery in Glendale, California. Others are located in Chicago, Pennsylvania and New York. As interest in feng shui grows, we can expect to see more cemeteries embracing some of these principles. And to be honest, anything that promotes peace, harmony and balance, even after death, sounds appealing enough to consider – just to be on the “safe” side.